Chris Newsome and Adrian Brown produced the following image of spiral galaxy M101 (visible in the upper left portion of the image) on the night of the 3rd March 2006. 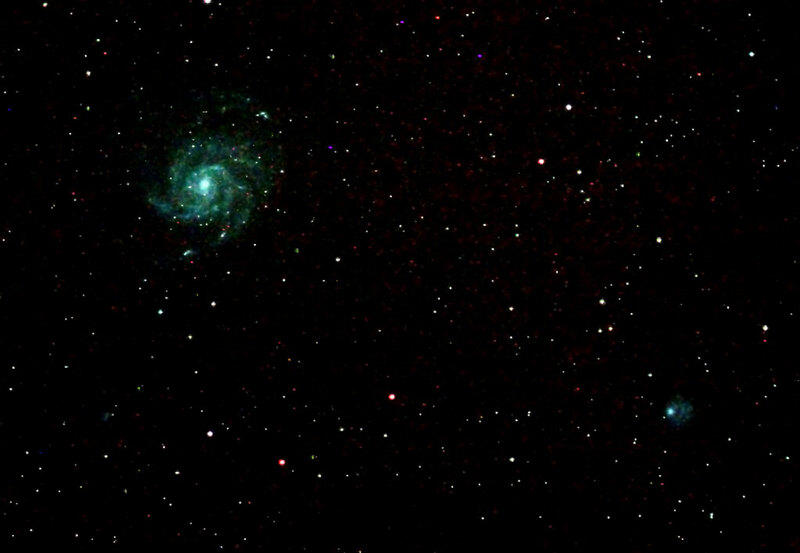 The galaxy NGC 5474 is visible to the lower right of the image and just below M101 is the very faint NGC 5477. The image was taken using using a Canon EOS 300D camera with a 2" Astronomik CLS filter at the prime focus of an 80-ED refractor. This set up was guided with a Borg refractor and ATK1C camera on a CGE mount. One 10 minute exposure and three 15 minute exposures were taken at 400 ASA. The images were calibrated in Maxim DL and then in CS2. The stacked image was cropped and processed using GradientXTerminator, RGB levels, curves and a Gaussian blur. The image was further adjusted by using the Reduce Noise and Despeckle filter in CS2. The TIFF image was then converted to JPEG format.